If you missed either of these, make sure you read them to get a well-rounded picture of the habits that impact your life. Today we’re going to move on to habits related to relationships. What comes to mind when you think of relationships? I think many people think of boy-girl relationships (your boyfriend, girlfriend, husband, or wife), but relationships expand far beyond these. Although these are important too! How about relationships with friends? Or family member? What relationship habits do you want to continue or create? For me, I want to be more intentional about all my relationships this year. With my husband, I want to get back into the habit of planning date nights. We don’t have kids, but that doesn’t mean we are always focused on each other the way we could be.This is a habit I want to be constantly cultivating! My goal related to this habit is monthly date nights with Kirk. A few years ago we got a date idea pack that we only used one, but we still have it! Time to put those to good use. Relationships with my girlfriends is something else I’d like to work on. I have friends scattered around the state that I really enjoy spending time with, but I never seem to see them enough! This year I’d like to get back into the habit of girl’s night out – a chance to cultivate relationships with other women. It seems silly I have to focus to plan this, but life gets busy and I get lazy. My goal related to this habit is regular girls night out – at least every other month. This is from the very first Atlanta Blogger group that I attended. Tina invited me & it was the first night I met Laura! Finally, Kirk and I really enjoy entertaining groups at our house. We did this more often when we lived in Atlanta and have let this slide a bit since we moved. Entertaining is a great way to share our life with people and show them how much we enjoy them as friends. It’s also a great way to introduce new people to each other, which means new friendships might form – always a fun bonus! My goal related to this habit is to host a group at least once a quarter. I have a Mardi Gras theme in mind to kick things off! Working on relationship habits should be fun, but it will take a little work on my part too. It’s so easy to slip into the comfortable and not take the extra time that relationships need to thrive! I hope this discussion of habits inspires you to think of the habits in your own life! If you enjoyed this post, use one of the buttons below to share it on your favorite social network! 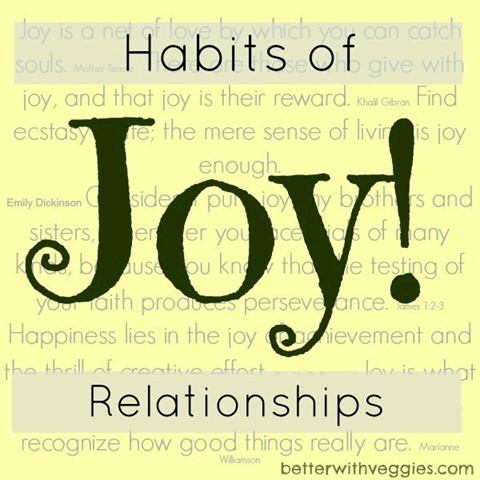 What is one relationship habit you want to nurture or develop? Do you find some relationships easier to focus on than others? « Can Comparison Be Good?